Jason Snyder's career has included stints as a White House Fellow, a senior official at the US Department of Education (DoED), a federal law clerk, and an education-law and appellate attorney at DC's largest law firm. But he says he's still a high-school government teacher at heart who believes that the success of our democratic system depends on more than just free elections, the rule of law, and an independent media. It also depends, he says, on a high-quality education system that provides every student with an equal chance to succeed. "We need education leaders who can connect policy to practice, collaborate with various stakeholders, and learn from what's working and what's not to improve programs and policies," he says. "If I learned anything from visiting schools across the country while at the DoED, it's that schools with a positive trajectory had teachers and other adults with a relentless focus on continually improving instruction through collaboration." Snyder believes that AU's Education and Policy Leadership Program is uniquely designed to produce education leaders who can do all these things—and more. The 30-unit master's degree program was redesigned in 2015 after a comprehensive review led by Snyder. His committee spent several months crunching data, surveying students and alumni, and speaking with senior education officials at organizations ranging from the US Department of Education to DC Public Schools. 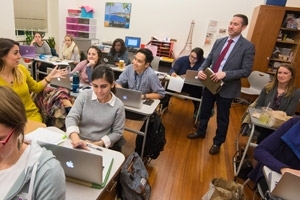 "We took all this feedback, examined the data, and developed a program that is practical and grounded in theory and research, that is local and national in reach, and that is focused on real-world experiences as well as learning in the classroom," says Snyder. The redesigned EPL Program places a special emphasis on policy and program implementation, and on connecting policy to education practice. It can be completed in as little as four semesters of evening courses, ideal for teachers and other professionals who work during the day. And its location in the nation's capital offers students unique summer consultancy projects at organizations including the National Governors Association, the DC Public Charter School Board, New Leaders, and Jumpstart. These projects, along with the contacts that participants make in the field, help them greatly as they transition into policy and leadership careers after graduation. As one student describes, the EPL Proseminar "allowed me to combine theory and practice in order to drive change in the field of education." The program also offers career panels and individual counseling for identifying career pathways and opportunities. Snyder believes that these one-on-one connections are critical. "I love getting to know my students," he says. "Since joining AU, I've met with each of my 320-plus students to talk about their backgrounds and interests. I take very seriously my role as an advisor, as well as a teacher, and believe that students are more comfortable in class when they know that their professors are invested in them as individuals." His students agree. "Professor Snyder is passionate about the topics he teaches and constantly pushes his students to challenge themselves and their thinking," says one student. "I loved that he requires each student to meet with him. It forces shy, reluctant students to build a relationship [with him]." Though Snyder is enthusiastic about the changes made to the program over the past several years, he continues to focus on increasing program access. "We're starting an online EPL Program for the Policy Studies track in the fall (along with a MA in teaching and a MA in Special Education: Learning Disabilities)," he says. "The Policy Studies track will help educators and other professionals from communities outside DC make an impact in K-12 schools by providing high-quality, distinctive online degree opportunities." Overall, Snyder's goal for the Education and Leadership Policy program is to create graduates who have the skills to succeed—and make a difference in the lives of schoolchildren—whether they chose to become leaders within schools, or in government, or at education organizations that implement education policies and programs that affect K-12 students across the nation. As Snyder explains, "We cannot forget, especially with today's increasing federal focus on school choice, that schools have a deep-rooted public purpose. Our program aims to develop policy leaders who can promote that public purpose of schools, while at the same time thinking differently about how to improve them. The success of our schools and our schoolchildren depends on both."